Road Hazard Protection within (1) year of purchase date or within the first 2/32nds of an inch treadwear (Whichever occurs first). 2. VARIABLE WIDTH SHOULDER BLOCK DESIGN: Reduces road noise while enhancing ride comfort. 3. 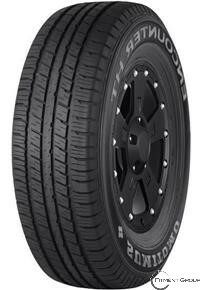 NON-DIRECTIONAL, FIVE-RIB TREAD DESIGN: Optimizes ride stability and protects against irregular wear. 4. WIDE CIRCUMFERENTIAL TREAD CHANNELS: Quickly evacuate water and boost hydroplaning resistance. 5. SOLID CONTINUOUS CENTER RIB: Promotes better handling and fights against irregular wear.